HistoScanning™ là một ứng dụng siêu âm mới, bằng cách sử dụng thuật toán phân biệt mô tiên tiến, để thể hiện vị trí và lan rộng của mô biệt hoá, nghi là ác tính. Ban đầu dùng cho tuyến tiền liệt, giúp bác sĩ điều trị chọn phương thức xử l‎‎í, lên kế hoạch điều trị và chọn lọc bệnh nhân ung thư để theo dõi tích cực, sau được phát triển cho ung thư vú, buồng trứng và tuyến giáp. A. Thuật toán chọn lọc dựa vào đặc điểm biệt hoá mô. Trình bày hình tượng hoá dấu ấn âm học (acoustic signature) điển hình của 3 thuật toán biệt hoá mô của vùng ác tính và không ác tính. Hình (a-c) thể hiện tổn thương ác tính và hình (d-f) là vùng không ác tính. Chú ý khác biệt giá trị của trục y giữa (a) và (d), (b) và (e), (c) và (f). B. Thuật toán phân biệt cá thể và kết hợp được tạo nên từ dữ liệu của bệnh nhân (scan + mô học) để đạt được phân cách thống kê tối đa. Đối chiếu các vùng ác tính và lành tính của tuyến tiền liệt cho kết quả các kiểu phân bố khác nhau về số hoá, phân bố của vùng ung thư (màu cam) lệch sang P (giá trị cao) trong khi vùng không bệnh có màu xanh. C. Thuật toán được cài vào trong máy siêu âm để tối ưu hoá việc phân biệt mô. Tích hợp các phân bố về toán học của 3 thuật toán phân biệt giúp xác định kiểu số hoá có khả năng giúp xác định rõ mô tuyến tiền liệt ác tính và không ác tính. Ung thư được phân biệt bởi tăng sản bất thường các tế bào ác tính làm thay đổi cấu trúc và đặc điểm mô. Biến đổi hình thái này ảnh hưởng đến kiểu tán xạ của sóng âm truyền qua mô. Thuật toán mới và độc quyền này ghi nhận được các thay đổi của tán xạ âm. Cách tiếp cận này giúp phân biệt đặc điểm cấu trúc mô xa hơn các kỹ thuật tạo hình siêu âm hiện tại. Thuật toán của HistoScanning có thể ứng dụng và xác định cấu trúc mô khu trú trong các cơ quan đặc biệt như tuyến tiền liệt, buồng trứng, tuyến giáp và tuyến vú. 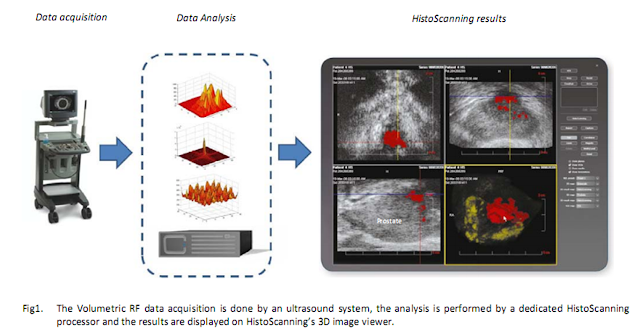 HistoScanning™ is a novel ultrasound-based application that utilises advanced tissue characterisation algorithms to visualise the position and extent of differentiated tissue, suspected of being malignant. Prostate HistoScanning™ is a commercially available specific application that can support physicians managing prostate cancer patients with treatment selection, treatment planning, and selecting patients for active surveillance. 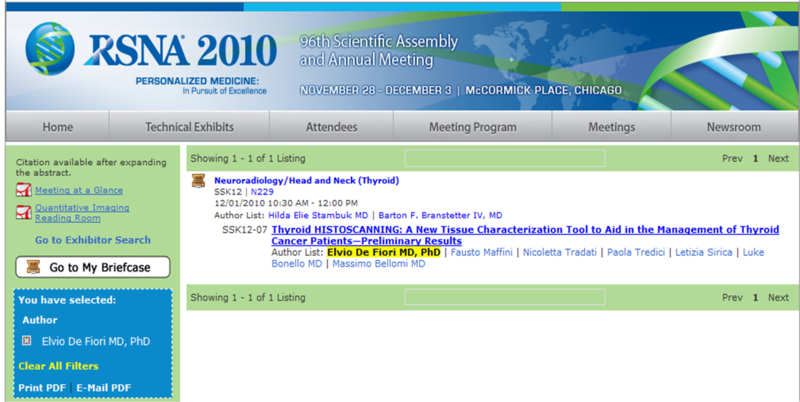 HistoScanning™ applications are being developed for Breast, Ovary and Thyroid. Cancer is characterized by an abnormal proliferation of malignant cells resulting in altered tissue structures and characteristics. 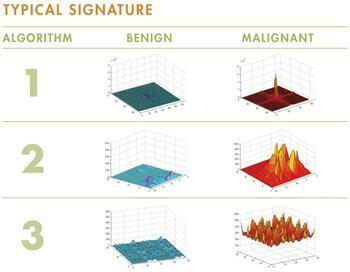 The resulting morphological variability affects the scatter patterns of ultrasound waves traveling through the tissue. Changes in the ultrasound scatter footprint are picked‐up by innovative and proprietary algorithms. 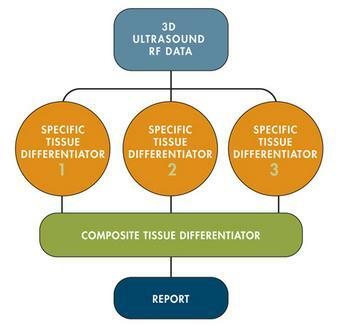 This approach allows for differentiation of tissue morphology characteristics beyond what is possible with currently available ultrasound imaging techniques. The algorithms used by HistoScanning can be adapted and trained to identify inute localized tissue structures in specific organs (eg. prostate, ovary, thyroid, breast, etc). • Prostate HistoScanning is primarily aimed at improving the clinical management of men presenting with elevated levels of Prostate Specific Antigen (PSA) and therefore scheduled to undergo ultrasound guided biopsy. Prostate HistoScanning may help rule out clinically relevant prostate cancer in men with elevated serum PSA due to non malignant conditions and guide biopsies towards the suspicious lesions in men with positive HistoScanning results. Furthermore, it has the potential to provide guidance in treatment selection based on the stage of cancer. HistoScanning for the prostate is currently under clinical evaluation. • Ovarian HistoScanning is for the clinical management of patients presenting with abnormal pelvic symptoms or a suspicious mass on a routine ultrasound scan. Ovarian HistoScanning has been shown in a multicentre clinical study to have sensitivity in the identification of cancerous tissue of 98% compared with 75% for the radiologist relying on the standard ultrasound scan alone. HistoScanning for the ovaries based on grey level data is currently under limited release. • Thyroid HistoScanning aims to address the clinical challenges associated with the differentiation and localization of thyroid cancer and may provide a non‐invasive alternative to actively monitor disease recurrence. HistoScanning for the thyroid is currently in the clinical evaluation phase. • Breast HistoScanning is aimed at supporting ultrasound‐based detection of malignancies in the breast and in particular improving the sensitivity and specificity of breast imaging. Furthermore, Breast HistoScanning is expected to facilitate screening in women with mammographically dense breasts. Prostate cancer is one of the few solid-organ cancers in which imaging is not used in the diagnostic process. Novel functional magnetic resonance imaging techniques offer promise but may not be cost-effective. Prostate HistoScanning™ (PHS) is an ultrasound-based tissue characterisation technique that has previously shown encouraging results in the detection of clinically significant prostate cancer. The present study reports on the open ‘unblinded’ phase of a European multicentre study. The prospective ‘blind’ phase is currently in progress and will determine the value of PHS in a robust fashion overcoming many of the biases inherent in evaluating prostate imaging. To evaluate the ability of prostate HistoScanning™ (PHS) an ultrasound (US)-based tissue characterization application, to detect cancer foci by correlating results with detailed radical prostatectomy (RP) histology. In all, 31 patients with organ-confined prostate cancer, diagnosed on transrectal biopsies taken using US guidance, and scheduled for RP were recruited from six European centres. Before RP three-dimensional (3D) US raw data for PHS analysis was obtained. Histology by Bostwick Laboratories (London) examined sections obtained from whole mounted glands cut every 3–4 mm. Location and volume estimation of cancer foci by PHS were undertaken using two methods; a manual method and an embedded software tool. In this report we evaluate data obtained from a planned open study phase. The second phase of the study is ‘blinded’, and currently in progress. 31 patients were eligible for this phase. Three patients were excluded from analysis due to inadequate scan acquisition and pathology violations of the standard operating procedure. One patient withdrew from the study after 3D TRUS examination. PHS detected cancer ≥0.20 mL in 25/27 prostates (sensitivity 93%). In all, 23 patients had an index focus ≥0.5 mL at pathology, of which 21 were identified as ≥0.5 mL by PHS using the manual method (sensitivity 91%) and 19 were correctly identified as ≥0.5 mL by the embedded tool (sensitivity 83%). In 27 patients, histological analysis found 32 cancerous foci ≥0.2 mL, located in 97 of 162 sextants. After sextant analysis, PHS showed a 90% sensitivity and 72% specificity for the localisation of lesions ≥0.2 mL within a sextant. PHS has the ability to identify and locate prostate cancer and consequently may aid in pre-treatment and pre-surgical planning. In men with a lesion identified, it has potential to enable improved targeting, allowing better risk stratification by obtaining more representative cores. However further verification from the results of the blinded phase of this study are awaited. To assess the value of ovarian HistoScanning TM, a novel computerized technique for interpreting ultrasound data, in combination with the risk of malignancy index (RMI) in improving triage for women with adnexal masses. RMI indices were assessed in 199 women enrolled in a prospective study to investigate the use of HistoScanning. Ultrasound scores were obtained by blinded analysis of archived images. 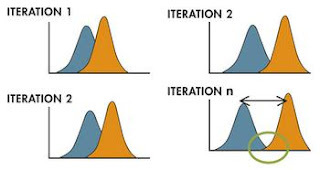 The following sequential test was developed: HistoScanning was modeled as a second-line test for RMI between a lower cut-off and an upper cut-off. The optimal combination of these cut-offs that together maximized the Youden index (Sensitivity + Speciﬁcity − 1) was determined. Using RMI at the standard cut-off value of 250 resulted in a sensitivity of 74% and a speciﬁcity of 86%. When RMI was combined with HistoScanning, the highest accuracy was achieved by using HistoScanning as a sequential second-line test for patients with R values between 105 and 2100. At these cut-off values, sequential use of RMI and HistoScanning resulted in mean sensitivity and speciﬁcity estimates of 88% and 95%, respectively. Our data suggest that HistoScanning may have the potential to improve the diagnostic accuracy of RMI, which could result in better triage for women with adnexal masses. Further prospective validation is warranted. Copyright  2011 ISUOG. Published by John Wiley & Sons, Ltd.